A development of the Sikorsky S-60 the huge S-64 that can carry a crew of five, but usually will fly with a pilot, co-pilot and engineer / rear facing observer had its first flight on 9 May 1962.Two were built for evaluation by the German Defence Force, but no orders were placed. The United States Army placed an initial order for six under the designation CH-54A Tahre whilst a further seven were sold to civilian operators. During 1971, Jack Erickson, a second generation logger and CEO of the Erickson Lumber Company engaged the services of Wes Lematta of Columbia Helicopters for timber harvesting. For years many lumber companies had experimented with helicopter logging, but with little success. Erickson's venture using Lematta's S-61 Sikorsky optimised the heavy lift helicopter and proved to be so profitable that he purchased his own S-64 early in 1972 followed by a further three later in the year. 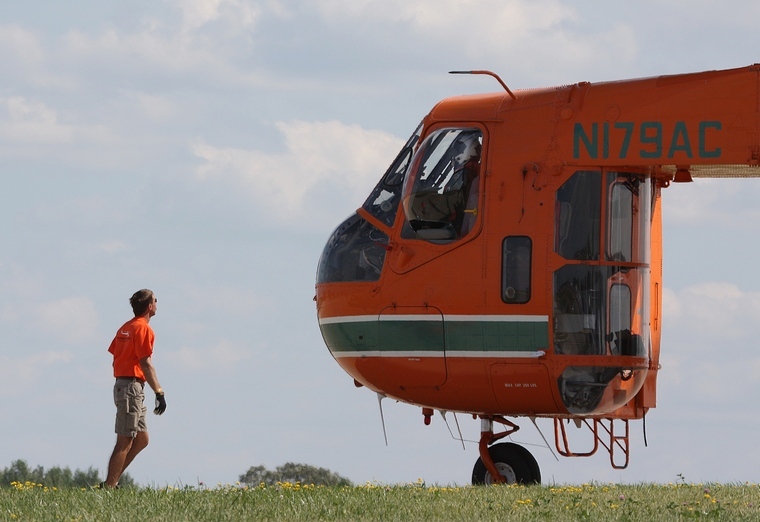 Now the owner of a fleet of S-64s, Erickson spread his wings expanding into fire fighting, infrastructure support, power line construction, oil and gas exploration as well as the transport of people and products. In 1975, one of his Skycranes placed the seven ton steel sections that made up the antenna and weathering metering systems of a 564 metre tall steel structure then the tallest of its kind. 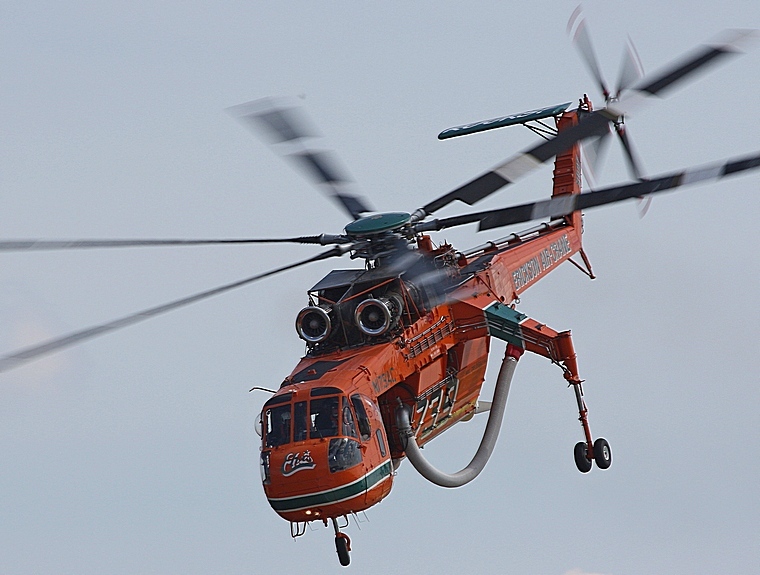 In 1983 an Erickson Skycrane transported 1,100 tons of heavy construction equipment to a remote road in Alaska in what is believed to be the largest civilian airlift operation at the time. 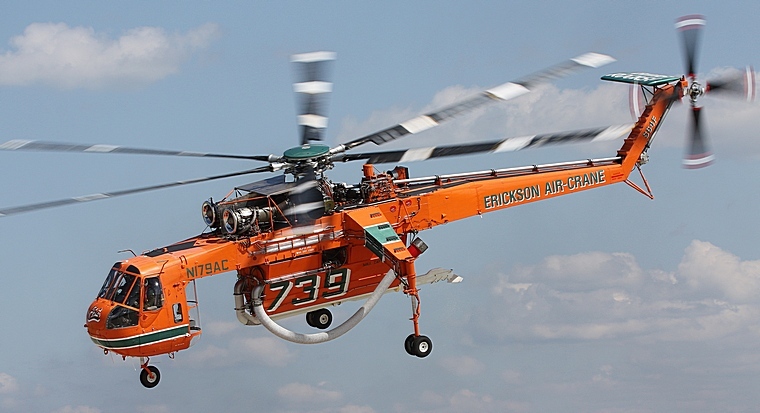 In 1992, Erickson bought the rights to manufacture the S-64 from Sikorsky and marketed it as the Ericson S-64E Aircrane. 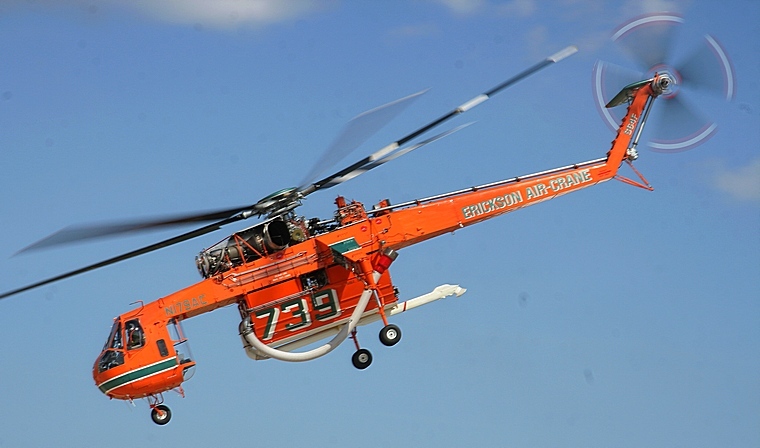 More than 1,350 changes to the airframe, instrumentation and payload were made making the Aircrane the perfect aerial crane. 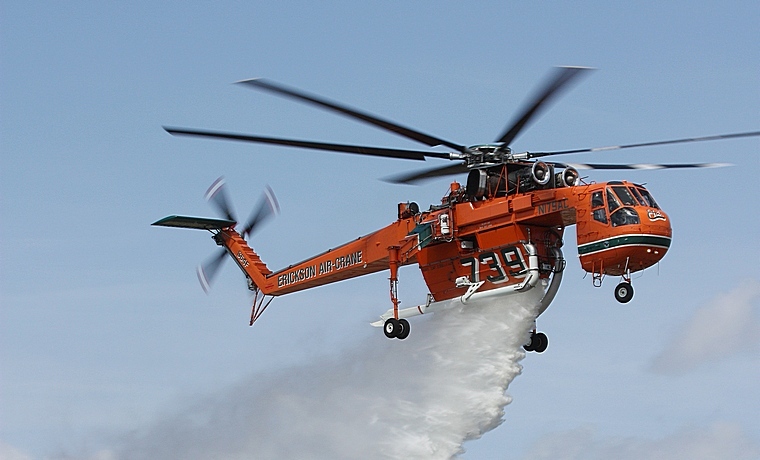 A 10,000 litre tank attachment able to deliver up to 113,500 litres of water, foam and retardant mix an hour combined with the manoeuvring and pin point precision drop pattern of a helicopter makes the Aircrane the ideal fire fighting machine available. 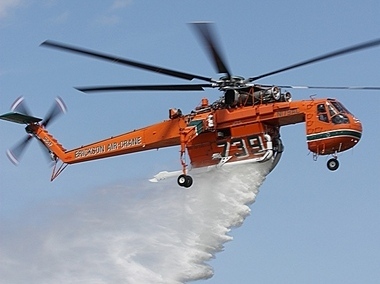 Besides remanufacturing existing CH-54 Tahres, Erickson's new Aircranes have been sold to the Italian and Korean Forest Services whilst those in the Erickson fleet are leased worldwide on short or long term fire suppression, civil protection, heavy lift construction and timber harvesting contracts. 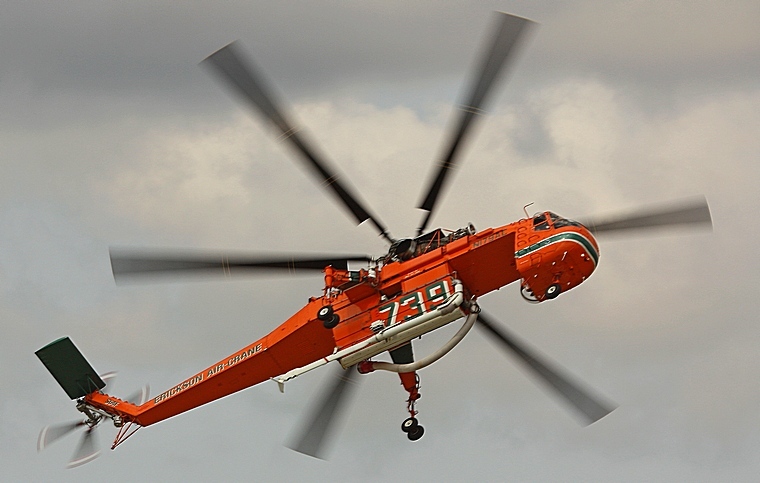 All Erickson Aircranes are given individual names. The most famous of them all is 'Elvis' who during the 2001 series of wild fires in Australia was one of the first and certainly the largest helicopter called in to fight the fires. Elvis arrived in Melbourne on 27 December 2001 and was immediately deployed to Bankstown, New South Wales to help with fire fighting efforts in the Sydney region. Two other Aircranes namely Georgia Peach and the Incredible Hulk were rushed out from the U.S.A on board a Russian Antonov An-124 air freighter to assist. During her stint in Australia, Elvis saved more than 1,500 homes and the lives of 14 fire-fighters and she became a national celebrity. A number of other Aircranes and Skycranes have subsequently been brought out to Australia for each bushfire season and are based in Western Australia, Victoria, New South Wales and the Australian Capital Territory. 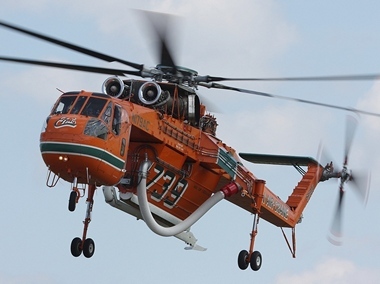 Three Aircranes have been lost during fire fighting operations. In 2004, Aurora crashed in Corsica whilst fire fighting on the Mediterranean Island. Gypsy Lady crashed during October 2006 whilst operating for the United States Fire Service when she snagged a dip tank. In 2007, Shirley Jean crashed in Italy. 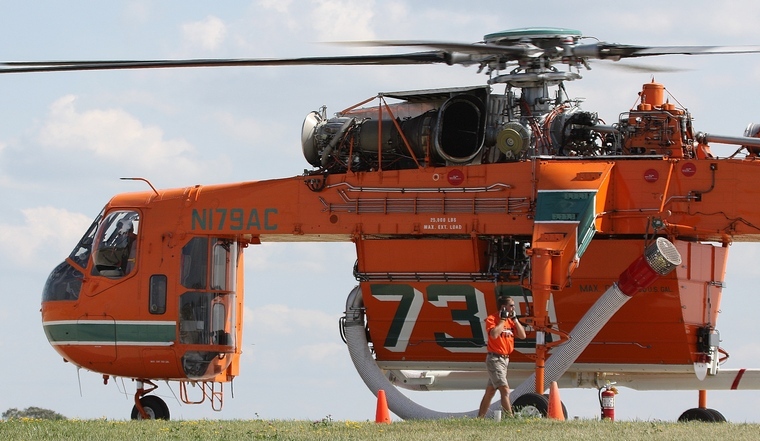 Erickson Air-Crane is the sole manufacturer and world's largest operator of S-64 Aircranes.